That’s right, it’s Friday and there’s a comic. Not a Thursday comic posted late but an honest to goodness Friday comic. That’s five comics this week, a first since…oh man its been too long. This entry was posted on Friday, May 14th, 2010 at 12:00 am and is filed under Comic. You can follow any responses to this entry through the RSS 2.0 feed. You can leave a response, or trackback from your own site. 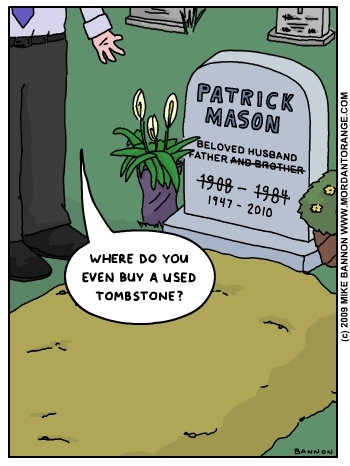 That’s the tombstone you get when your ex wife buys, methinks.